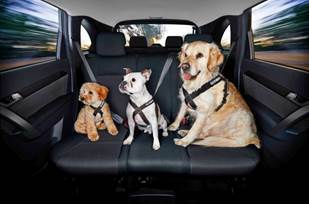 Each year in Australia more than 5,000 dogs are injured or killed in auto-related accidents, most as a result of being ineffectively restrained in the car, or not restrained at all. 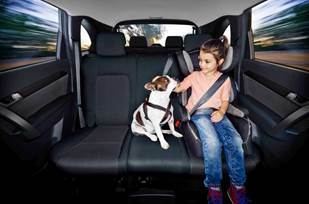 With an estimated 840,000 dogs about to take to the road this summer to accompany their owners on holidays, pet care brand PURINA have provided us with their safety tips for dogs travelling in cars. According to a crash test conducted at the NRMA Insurance Research Centre in Sydney in Decmeber 2013, even at a collision speed of 20 km/h, an unrestrained pet, sitting in the back seat, can become a dangerous projectile, hitting the dashboard with enough force to cause serious injury to the dog, the driver and other passengers. 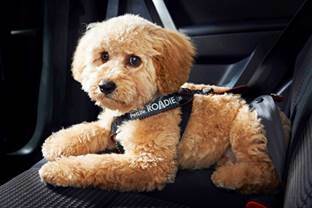 The only two harnesses that passed NRMA testing were the Purina Petlife Roadie and the Sleepypod Clickit harness. In the back! : Just like kids, pets are safest in the back. A dog in the front can distract the driver, and in a crash, the force of the air bags may fatally injure even large dogs. And never drive with your dog in your lap! Ute-sense: By law, dogs must be restrained in the back of a ute, or other open vehicle or trailer. If a dog is not secured with a short lead, that allows him to reach the sides, then he may easily become tangled in it, fall or jump out, causing a potentially fatal injury. If they are riding in the back, remember you must protect your pet from the elements. Head and paws in the car: Putting his head out the window may expose the dog’s sensitive eyes, ears and nose to harmful particles of dirt and dust, which can cause infection. He also runs the risk of bumping into objects. Are we there yet? : Kids aren’t the only ones who get bored and restless. Dogs too need frequent breaks. Try to stop every two hours for water, a toilet break and a short walk. On alternative stops, let your pet have a run if possible and a sniff of the area for interest’s sake, but don’t let him overheat. Be sure your dog is safe when in a strange place, especially in high traffic areas. Keep him on the lead or in a secure fenced place, which permits dogs off lead. Keep it cool: Dogs can rapidly dehydrate and suffer from heat stress during the warmer months, and the inside of cars heat up quickly. Never leave a pet unattended in a car, no matter if the weather is hot or cold. Your dog is a backseat driver: Your dog responds to your moods. If you stay cool and collected in the car, your dog will be a relaxed traveller. If you get angry or anxious, he may become frightened and stressed. So keep calm and drive on, remembering to speak to him encouragingly from time to time to keep him happy and secure.